Utahredrock: About that Ikea kitchen . . .
Last Saturday I had three generous and talented friends help me begin the installation of my Ikea kitchen. We made a lot of progress. 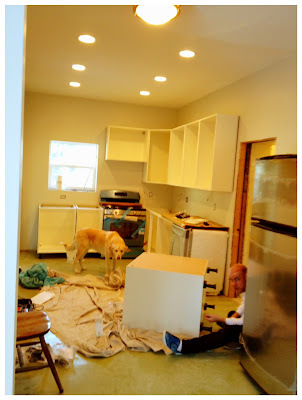 On Sunday, two other friends helped me raise the upper cabinets. Since then, despite significant effort, I've felt over my head and have accomplished little. I have a new helper arriving tomorrow to see if we can move this project forward. Here's what it looked like at the end of last Saturday, and what it still looks like now. There are MANY hundreds of parts remaining to put together to finish this job. The whole process is overwhelming and I am beyond my skill zone and stretching point. Hopefully there will be some progress tomorrow.